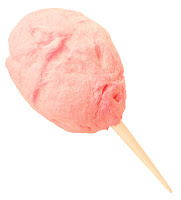 Who can resist a big fluffy cotton candy on a stick. Nowadays it mostly comes in bags but I still prefer the paper cone and watching the maker twirl it around as the sugar spins out. Cotton candy dates back to the late 1800s. There are four people credited with the recipe but only two, John C. Wharton and William Morrison obtained the patent for the machine in 1899. They premiered it in 1904 at the St. Louis World's Fair. The cotton candy machine heats the sugar which is then spun by centrifugal force and forced into the center of the machine through tiny holes that form the fine strands of the sweet stuff that is collected on a paper stick. My favorite fair food is a candy apple--the real ones with the crunchy red coating. I don't mind the caramel ones but in the heat of summer they can get really gooey. And of course it's a serving of fruit so it's good for you. Right?